Disclosure: Influence Central received jewelry samples from Touchstone Crystal by Swarovski to facilitate this review. Opinions are our own. From evening obligations during the holiday season to fun-filled girls’-nights-out, dressing up to go out can be fun. We can all smile a bit wider and stand a bit taller when we know we look our best. 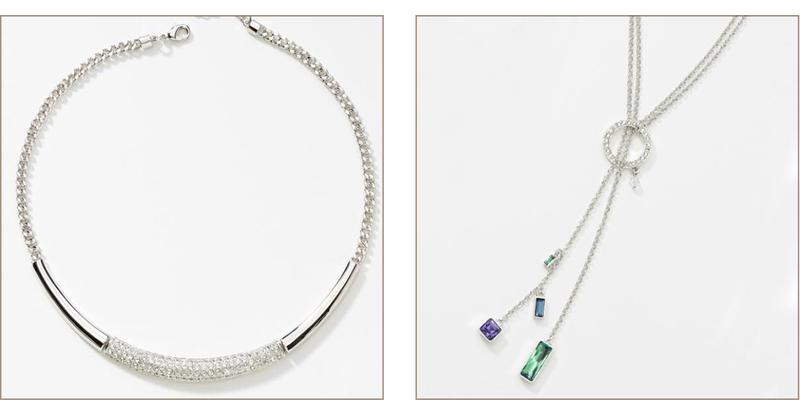 Adding sparkle to an outfit can amp up any look, made easy with eye-catching, light-reflecting jewelry from Touchstone Crystal by Swarovski. 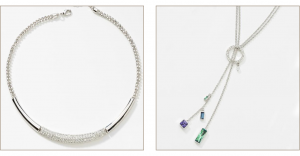 Your choices in the Touchstone Crystal line range from a clean, short, crystal-covered White Collar Necklace ($79.00), to the flowing, versitile, colorfully-jeweled Erinite Lariat Pendant ($69.00). These clear-crystal or multi-colored pieces could complete your outfit for a fun evening out with friends or even a casual coffee meet-up. Choosing just the right piece for whatever you wear becomes effortless with these timeless designs which pair as easily with a LBD as they do with jeans and a tee. 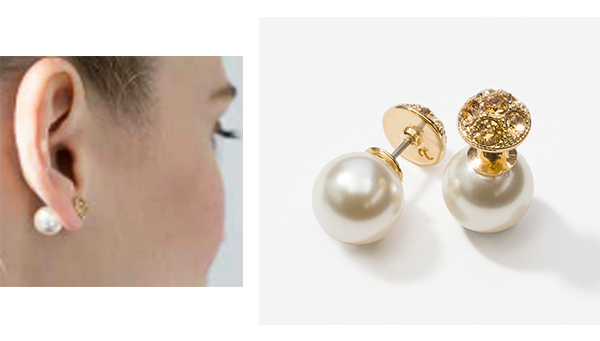 Since your ears always need to get dressed up, Swarovski offers three ways to wear the Flip Side Earrings in Cream Pearl ($34.00). 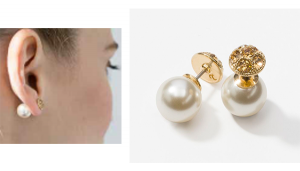 The pearls stand alone as classics with regular backs, or get combined with the crystal-studded cushions which can be worn behind the lobe or with the pearl backward. You could create an entire outfit around these earrings where they become the focal point (pair them with a cocktail dress and wear your hair up for oohs and aahs)! The reflective and shimmering Dazzle Pendant Necklace ($119.00) catches the light without weighing you down. 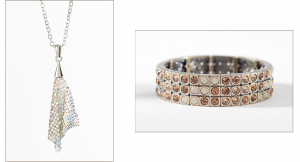 Whether worn with a low-cut dress or a crew neck, you’ll sparkle your way through the evening. Prefer a stately and low-key look? Opt for jewelry other than the striking, on-trend Emerson Bracelet ($99.00) and let the compliments roll in. 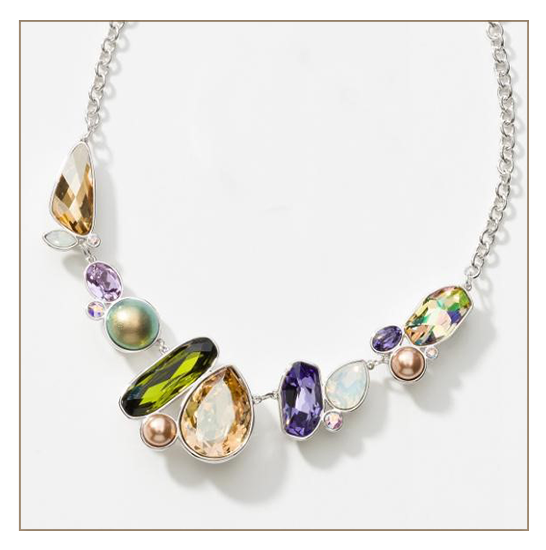 As we approach gift-giving season, perhaps that friend you can always count on would love the colorful, beautiful Mosaic Necklace ($149.00) that stands out from all other necklaces, just the way your treasured friend stands out from a crowd.